The new site will be the primary web site for the former Mid North Camera Club, now operating as the Bay of Islands/Kaikohe Photography Club, so please bookmark the new site and use that from now on. Shaun advised he still requires many more before/after images to fulfill our commitment for the grant we received from the Creative Communities Funding Scheme. It is up to each and every member to partake in this exercise, and time is of the essence. The offer from Wharepuke Art Gallery was deferred to our March meeting due to a full programme this month. Matters Arising from Committee/Sub-Committee meeting. The change of format for our monthly meeting was read out (A copy of which is attached to this newsletter) followed by a five minute Question Time. Vin gave his presentation on the workings and benefits of the PSNZ. Vin enlightened many of us on the finer points and one of the benefits being a substantial discount given when attending any of the Conventions. Vin felt the conventions were well worth attending and the workshops associated with these were very beneficial. He went on to explain how to apply for a Licentiateship (LPSNZ) the starting point of the Society’s honours ladder. Any financial member of a Club affiliated to PSNZ can apply for an ‘L’ You do not have to be an individual member of PSNZ. Ps. A website has been forwarded to the judges for their perusal (written by a PSNZ member.) This website covers many aspects of judging, but if this does not cover all that is required, the PSNZ will be contacted directly. It was bought to our attention that we are not covering all aspects of digital imagery. Doug has covered this in his ‘President’s Comments.’ I am also pleased to advise Doug will be writing a ‘President’s Comments’ each month, and these will be attached to this monthly newsletter. Our next meeting will be at Cherry Park House, Landing Road, Kerikeri. 7pm start on the 8th March, 2012. At our first meeting for the year on Thursday 9th February 2012 at Kaikohe, Vin is going to give us an insight into the workings and benefits of the PSNZ. It appears few of us understand the benefits of belonging as individuals, as compared with membership through our Club. ACCEPT – MERIT – COMMENDED – HIGHLY COMMENDED – HONOURS. Above is our Honorary Photographer to the Kaikohe A P & H Assoc. Inc. who is about to go aloft in a Top Energy bucket on his official business. If you know of anyone who may be interested in joining our Club, please invite them along to join us. As your new President, I’d like to wish you all a merry Xmas, good health and a happy and prosperous 2012. My aim will be to encourage higher turnouts at meetings. Our club can only improve through regular attendance with as many taking part in competitions and activities as possible. Friendly discussions, sharing ideas and fun at the same time increases ones knowledge and confidence so that photography can be enjoyed at all levels. This not only makes it more interesting for everyone but helps to make us think a bit in a creative way and develop skills. At times last year I observed a limited amount of interest and participation by members and wish to know if it was due to lack of time and opportunity, uninteresting competition subjects, or not enough digital competitions. We could develop into a more visually oriented group and to this end the purchase of a good quality screen will make viewing of projected images more enjoyable next year. There may be a case for “open” subjects to be added each month for those who have difficulty getting images to enter in the “set subject classes” and this could be discussed at our next meeting. As an idea, each month could still have a total of three images submitted by a member but a maximum of two for any one subject and one in the other. With all subjects we could possibly look at having a maximum of one print or none at all if this is favoured. An open class subject could include an image taken during the last two years as long as it has not been in a competition before. Our club’s aim is to cater for beginners through to professionals and point and shoot cameras to DSLR’s. We all have a lot to gain by entering competitions and learning from friendly, constructive and helpful criticism. The Far North Council Then and Now project appears to have stalled. As the council sponsored us, we have an obligation to put more effort in and undertake to complete this important project as soon as possible. To members who have not submitted images, which may be digital, please put your thinking caps on or get family and friends involved for suggestions by looking up their old photos and books to scan images from. “Then and now” does not necessarily imply old age only, but change as well. This may be where a building has been replaced or modernized, (woolshed, cowshed, freezing works, factory, house, church, hall, school, railway, airfield, wharf etc) as well as a park, playground, beach area, sports field or road that’s been upgraded. Your photos could also show where there has been no change at all as it would be of interest to see how little some things have altered over a lengthy period. While it would help to photograph from the same viewpoint, the main objective is to have images that convey what has happened over a period of time and what has transpired in Upper Northland. Your committee is there to help you enjoy your membership, so please let us know what you would like and how we can improve the club. Please contact myself or Coral regarding guest speakers, workshops and fieldtrips you would like provided. February competition = “ Holidays” in digital format. Plus, your Then and Now project. After a very disruptive start to our meeting (one very drunk intruder who certainly was not there to learn about photography) Steve proceeded with his most interesting talk. Steve touched on many interesting aspects of photography and with many questions being asked by members it became a very informative night. The three main filters Steve uses are 1. Polarizing filter for landscapes etc. and in particular rainbows. 2. 81b filter – used in bush etc. where there is a lot of green and 3. Graduated filter. This is used mainly to dull down bright sky. As Steve does a lot of bird photography he showed us the Better Beamer Flash Extender which he uses. If anyone is interested in taking this further, go to the ‘birdsasart’ website, where they are available to purchase. Thanks so much Steve for your time and effort and we were all sorry it started with so many distractions. Thanks also to Shaun for managing to remove our ‘drunk mate’ without too many hassles. Our next meeting will be the AGM and the last meeting for 2011. At this meeting Jill has made a presentation for us to see, which is about “The Camera Club’ in general. Looking forward to seeing it Jill. Other members who did the Tiritiri Matangi trip, will also be bringing along some of their images. Should make an interesting night. The AGM will be at Kerikeri on the 8th December at the earlier time of 6 pm. Everybody please to bring a plate of food to share. If you wish to view all the Interclub Competition entries they are on the Whangarei Camera Club web site – thumbnails only and will be there for just a few weeks so be quick. Due to the likelihood of lack of numbers that will be attending our meeting on the 10th November, we have decided to cancel that evening, and hold it one week later on the 17th November. At our September meeting Denis went through the received mail that had not been forwarded to members. Yours truly gave a presentation on taking and adjusting Smoke images, plus the taking of Bokeh images. Next we went through the New Life images that had been received. As Denis had missed putting the ‘Logo’ images on to his laptop, we only had a few from Alan to look at. Therefore at our next meeting we (depending on numbers) should be able to peruse all Logo images and decide whether or not one is suitable to adopt as our Club’s official logo. The Whangarei Interclub meeting was a success once more, with eight members attending from our Club. The judging was harder this year, with no 10’s being given. Alan was our top scorer with an 8. Congratulations Alan. Whangarei Club came first scoring 71 points. We came second with 56.6 and Dargaville and Wellsford tied with 53.5. It appears as though Whangarei will always come first being a much larger club and therefore a lot more images to choose from, but our ‘second’ was good to see. The subject for our next meeting is Diptychs or Triptychs. Also this month we need to have all of the ‘Self Assignment Project’ images in. Just a reminder – the Self Assignment Project is a set of four images that all relate to each other in some way. It would also be good to see more Logo images giving us more to choose from. Our next meeting will be at Kaikohe on the 17th November 2011. It was brought to our attention the state of the cups etc. at our Kaikohe venue. This situation can only get worse because all the kitchen cupboards have now been locked and the detergent, clothes etc. cannot be used. As from our next meeting the Club will be supplying paper cups, teaspoons etc, therefore also saving the job of washing-up. The used cups will be put into a plastic bag and Alan will dispose of them at home. The subject for next months meeting is ‘New Life.’ As this gives a wide range of subjects, we should get an interesting range of images. This month it is digital only. Don’t forget your original images as well as your final adjusted image. Maybe, whoever took the photos could give a brief rundown as to what adjustments etc. have been made to bring it up to the final result. Thanks John for bringing along your glass-beaded screen. It appears the images were better on this screen with images being clearer and more true to colour. A slight alteration to the brightness on the projector also improved the images. Alan is checking on prices for a beaded screen, and will update us at our next meeting. We were hoping to add a ‘tip of the month’ in each newsletter, but to date I have not received any. At the August meeting time was short so we didn’t see the ‘Logos” that have been designed. Please bring them all along to the next meeting as the end of the year is looming fast and we are going to run out of time. 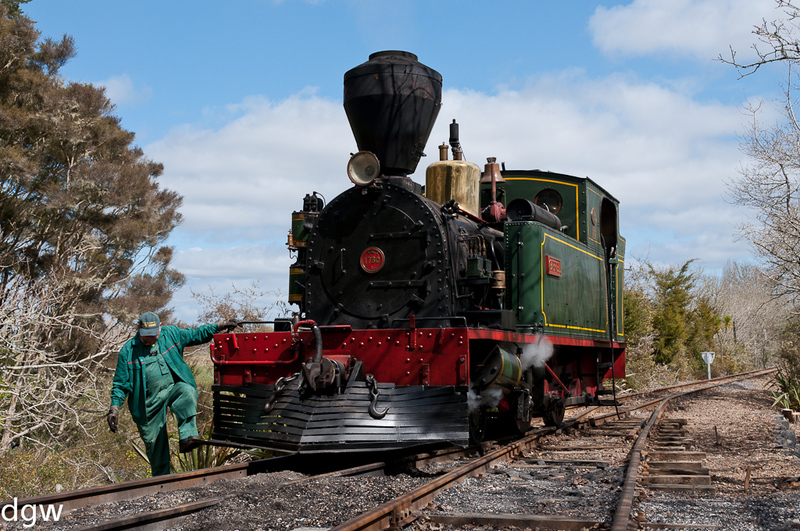 The Kawakawa Vintage Railway workshop was a great success. Everybody thoroughly enjoying it and the outcome were some very good images. Next months meeting will be on the 13th October at Cherry Park House, Kerikeri starting at 7 pm. 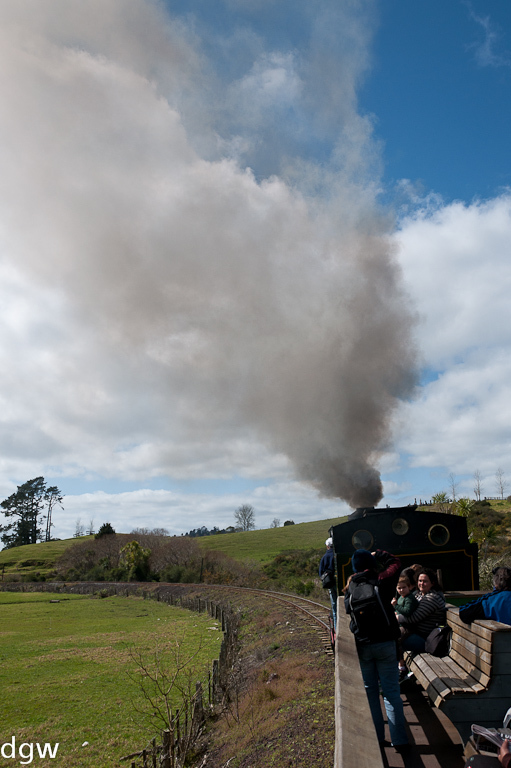 A group of us enjoyed an afternoon out on Sunday 4th September 2011 riding the Bay of Islands Vintage Railway from Kawakawa to Taumarere. Some members brought their cameras along so it became a hands-on evening which always makes it more interesting, and better for learning. Thanks Alan for all the time and effort you put into this, and thanks also to our two models – John A. and Dot. Thanks Claire B. for bringing along the Camera Club Photography books so everyone could see exactly what we have got. If anyone has taken a book on loan, please email Claire so she can keep a record of it. If anyone is interested in ordering photo paper, remember Irene has found a supplier who is prepared to give us discount. The price difference is quite amazing. A ‘named’ brand is approx. $2.28 – $2.90 per A4 sheet. This paper is 59c per A4 sheet. For those who are interested go to www.asia-digital.co.nz and click ‘Other Products’ then ‘Printing Products’ then ‘Inkjet Media-Cut Sheet.’ Next order whatever you require and then proceed to ‘Check-Out’. Camera Club Members have a redemption code to put in ‘Enter Your Redemption Code.’ Enquire Coral or Denis for this. At this stage he will give us 10% discount, but if more orders are placed he is prepared to give a bigger discount. The packets are twenty A4/A3 sheets.